Dozens of religious Zionist rabbis published a letter supporting the Israel Security Agency (ISA or Shin Bet) Friday, and stated that they condemn all manifestations of hatred and violence, such as 'price tag' attacks directed against the Arab population. "We state that these actions are in stark contrast to the Torah of Israel and Jewish ethics," the letter stated. "We urge educators and rabbis everywhere to continue to teach the way of the Torah of Israel to their students." "We stand with the Shin Bet security service and all security forces in maintaining our country's security, [including] rooting out all signs of Jewish terrorism," they added. Signatories included, among others, Efrat Chief Rabbi Shlomo Riskin; former IDF Chief Rabbi Avihai Ronsky; Jerusalem Chief Rabbi Aryeh Stern; head of the Human Rights and Judaism in Action Project at the Israel Democracy Institute, Rabbi Benny Lau; chairman of Tzohar, Rabbi David Stav; Tzohar founder and Rosh Yeshiva of Yeshivat Hesder Amit Orot Shaul, Rabbi Yuval Cherlow; Rabbi of Ma'ale Gilboa, Rabbi Binyamin Holtzman; Rabbi Baruch Gigi, co-dean of Yeshivat Har Etzion; and Tzohar co-Chairman, Rabbi Rafi Feuerstein. The letter of support follows an ongoing saga of serious torture allegations made against the ISA by suspects interrogated regarding an arson attack and murder in the Arab village of Duma in July. 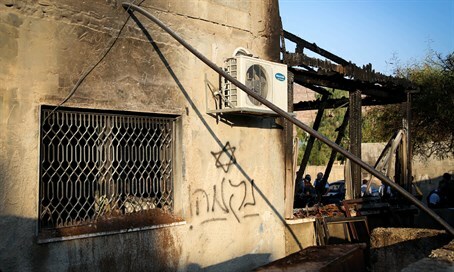 Amid the scandal, footage has also surfaced of a wedding in which participants danced while holding up weapons, with one person seen holding up a firebomb and a picture of the Arab baby murdered in the arson. The video has led to widespread condemnation from religious and public officials.